No, that is not wax paper. That is Cubic Tech’s CTF³ ultra-light fabric. It consists of specially arranged and prepared Dyneema fibers, which of course you know as ultra-high-molecular-weight-polyethylene. For those non-chemists out there, the fibers are amazingly strong and light. The resulting fabric is waterproof, tear-resistant, and most unimportantly, flame retardant. The Crazy Idea Cloud DNA is a skimo race pack built with this fabric that has all the features you’ve come to expect. You cannot get lighter than this pack, yet it is no weakling. Enjoy your trip to the clouds. 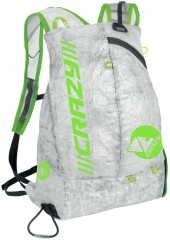 Rapid ski attach/release system means no taking off your pack. Ergonomic shoulder straps are made with a breathable mesh. Side access crampon compartment has a quick Velcro closure. Shovel blade pocket and internal loops for the handle and a probe. 2mm Dyneema loops for attaching ice axe, partner tow and ski carry. Chest strap with a whistle ticks a requirement for some races. What's the topside ski attachment on this pack? I don't see a hook. Thanks. Hi Scott, that strand of webbing over the right shoulder is a wrap-around latch.